"We have THOUSANDS of mothers in our networks who are laser-focused in their powerful t'FEEL'ot to have you & your ilk considered as "malshinim, minim, & zaidim" "
What lovely sentiment. My mummy always told me "if you have nothing nice to say, say nothing at all"
If that alleged TED talk by Bill Gates actually happened, she would have included a link to it. I searched for "vaccination" at https://www.ted.com/talks and it's not there. Also, her rant reminds me of Christians threatening us with hellfire if we don't accept Jesus Christ as our Lord and Savior. Of course, though, he didn't mean that vaccinations will directly lower population growth. He believes, rather, that people have more children when they fear that their children may not make it to adulthood. Nonsense! He said exactly what he meant to say. Don't be such a lamdan into his words. Simpletons and charlatans take Gates' words out of context. There's an atheist of the typical New Atheist type who on his Facebook is railing against Bill Gates as a vaccination hypocrite and denouncing vaccines and even made an Antivaccination Facebook Group. CNN just reported that measles outbreak has now spread to Michigan. The source for this outbreak Brooklyn and Israel!! What a colossal chillul Hashem! Considering how many times she insults you in this one message, I think it's safe to say that her opinions on proper behavior are not worth the electricity she used to make them known. Agree. Naim doresh, naim mekayem. By the way, I'd like to thank you for naming names. I realize that in this case it's easy enough to find out who founded PEACH, but I hate it when people who seek to harm others are left unnamed. Telling people that someone is trying to harm them without telling them who just creates paranoia, and saved no one. These people are absolutely impervious to reason. Don't even try. Let's say she's right: You need to learn humility, the pharmaceutical companies are devils, and the anti-vax people are amazing. And we should listen to Del Bigtree, who will convince us. And if we're not convinced, it's only because of our bad middos. The truth is, anti vaxers are probably right about vaccines causing many harmful effects. The debate needs to be whether it makes sense to accept these harms and casualties in place of perhaps more severe diseases which ultimately lead to more death. By saying that they are wrong about everything only reinforces their position, since clearly there is some truth to their claims. Incorrect. The reality is that a tiny, tiny, miniscule portion of people receiving vaccines will have side effects, as sometimes occurs with medications. But vaccines are overwhelmingly beneficial and the rate of side effects is vanishingly small. They are wrong. Most complications aren't directly attributable to vaccines (the parents just want them to be, so they see what they want to see), and even if they were, I'd take the small chance of harm from vaccines over the far greater risk of severe complications from the diseases we're protected from. Vaccines save lives, period. You can argue with the facts all you want, but that doesn't mean we should still be having that debate. It's been proven many times: vaccines work, and any perceived harm from vaccines is mitigated by the lives that have been saved. These people won't change their minds, though, so any "debate" is worthless. Miriam MD: You know what has more of a "known risk" than vaccines? Measles and other preventable diseases. Miriam MD: I'm okay with not forcing vaccination, as long as you don't leave your house and infect others. My siblings had measles 30 40 years ago, my kids had it this year no big deal. @moishe: There has already has been more than one death from this outbreak. Sometimes it is somewhat mild and other times it is deadly. Especially for people with suppressed immune system, pregnant women, etc. If 1% of people die of a certain disease 99% will say "well I survived". The 1% is enough. (Set aside those admitted to the ICU, with permanent negative non-fatal results, etc). As much as I disagree with her views, I think it is very wrong, for you to post this person's text messages in order to belittle her (unless she gave you permission.) Did she give you permission to post this? I think it's perfectly fine. First of all, these are her views that she believes in promoting, so why should there be any reason for her not to want them publicized. Second of all, if letting people have a better understanding of anti-vaxxers somehow harms their efforts, that's good for society. Actually, it is a mitzvah for Rabbi Slifkin to name and shame her, as hopefully that will cause a decrease in the disease, injury, and death she is promoting. I had figured it was a given that you had received permission from her to post her text message on a public forum and would never have thought to asked. I am honestly shocked this is not the case. This is a gross violation of her privacy. You're entirely wrong. You have no right to publicly post someone else's private text messages to you. Really disappointing and unethical behavior. Lashon Hora L'Toeles is allowed. There is no greater Toeles than discrediting something that causes disease, injury, and death. You have every right to publicly post someone else's private messages to you unless there is a prior understanding that you won't. Of course, even this may be mitigated by circumstances such as would apply here: publicizing and ridiculing the actions of an individual who is a danger to society. This lady is sending Rabbi Slifkin repeated, unsolicited messages, which are harassing and are full of disturbing curses and bad wishes. She is doing so as an official representative of a very public institution, namely PEACH, whose agenda is public for all to see. So I think for Rabbi Slifkin to publish the messages verbatim is certainly justified, not only as minimal self-defense, but also to alert others to PEACH's actions and methods. I wasn't persuaded until I saw that she wrote "pHARMa-satan." That's when I realized the word "harm" is in "pharmaceutical." It's been right there all along! Hiding in plain sight! How could I have been so blind?! I feel so piti-FOOL! You can only unvacSINate using a tesHOOVER. Perhaps the repercussions of lashon hora and sinat chinam these conversations are generating are worse than anything a physical ailment can do to us. Are we giving up our olam haba over this? Doesn't anyone consider the measles outbreak is "me'et Hashem? Or is Hashem out of the picture here? Perhaps it's time for some rabbinic introspection as to what Hashem is trying to tell us rather than trying to lay blame on others. This is the work of the satan. We are supposed to have the Torah as our guide, not the CDC and Paul Offit, an athiest of Jewish heritage, who has come out visciously against metzitza b'peh - he says on his website "...and ultra-Orthodox Jewish mohels spread herpes by using contaminated circumcision tools."http://paul-offit.com/booksby/bad-faith/. He would also like to ban bris milah. Is this an appropriate person to listen to and allow control over our bodies? Some kosher food for thought. We do believe in the natural order of things. We have our own hishtadlus to do, and the importance of the hishtadlus we need to do in order to keep ourselves and our community, and the world at large, safe and healthy cannot be understated. Perhaps the measles outbreak was Hashem's way of saying that we should vaccinate. It should not be necessary for me to state that the Bill and Melinda Gates foundation that gives billions for measures that promote human health and well-being, including funding measles and other vaccines for poor nations, are not a cabal to reduce human population. However, the citation of Bill Gates' TED talk. taken out of context, could lead the naïve to such a belief. Here is a better indication of their views and aims from the Fact Watch website. While it is understandable that some people will adopt false and even dangerous beliefs. Such beliefs and viewpoint expressions do not make them bad people - only naïve. However, the statement from the founder of PEACH alluding to the alleged prayers of thousands of affiliated women to include our blog owner and others like him in their 'velamanshinim al tehi tikva..' recitation is not only unacceptable but approaches the severe torah injunction of 'mechasheifa lo techaye'. That's what threatening someone with a deadly curse in order to control their behavior implies. Agreed that its poorly written, making her appear, as you say, somewhat unbalanced. But that they believe they are the ones saving lives and its the others who are harming people - what's the chiddush in that? In every debate that's what every side believes. I retract the first sentence above, not realizing that her words were from a text message, that she sent you privately and you posted publicly, with her name and without her permission. For shame. Text messages are informal and are not held to the same standard as other mediums. That goes double for private messages not intended for publication. She has a reasonable expectation of privacy in what she sent, and you violated it. Had it happened to you, you'd be referring to yourself in third person as a martyr, and would speak of her "notorious" attempts to stifle you. May the terrorists from Anti-Vaxistan be stopped. Her mentality is an extreme extension of an extreme type of charedi mentality which brooks no dissent and grows by making weak people feel less frum if they don't follow its party line. Breslov.com's featured writer on women and family has a similarly thoughtful and balanced analysis on this topic. This is not a balanced analysis. 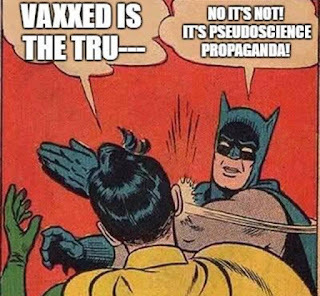 It is an anti-vaxx screed. To take one of "n" examples, she falsely claims that the smallpox was not wiped out by the smallpox vaccine. I'll try to be more explicit in my sarcasm next time. I think I understand this. All drugs have side-effect except vaccines which ALL work perfectly for ALL people. And the adverse reactions listed on inserts are there for legal reasons in case of lawsuits, oh wait, you can't sue vaccine manufacturers or admins, So lets just revoke that law and see what happens. Don't make strawman arguments. Nobody said what you claim they're saying. Vaccines also can have RARE side effects. Nobody disputes that. The risk is minuscule compared to the risks associated with getting the diseases we are trying to prevent. You're 100% correct as to what would happen were there no vaccine courts: Vaccines would no longer be available, as no manufacturer would be willing to accept the liability. That's because every parent whose child has some terrible disease or another will sue them in front of a sympathetic jury, claiming that their child's illness was due to the vaccine. The jury will make its decision not based on the science, but with their emotions, seeing a terribly sick child on one side and a wealthy corporation on the other. The result will be no more vaccines, which the government considers a threat to public health. Hence, the special vaccine court. However, that does not mean that the manufacturers coul dnot be sued for actual negligence and the vaccine court's decision can be appealed to a regualr court. You might be happy if all vaccines disappear, but the health authorities wold not. No rational person would be happy to see vaccines disappear. And I fully intend the corollary. If Simcha Scholar from Camp Simcha and other vaccine pushers found the cure for cancer or at least the cause would he promote it? Ask your doctor why do so many kids have leukemia and other types of childhood cancers today while they didn't 30 years ago?? Apparently they're all baffled and clueless. It's a BIG mystery to them. We Just DON'T know! they say! But not everyone is so ignorant and foolish. Again I ask if Simcha Scholar found the cure for cancer or at least the cause would he promote it??? I guess the answer is a big fat NO since he would be putting himself out of a job and all the people that work for Chai Lifeline. He'd rather make them feel good while they're dying rather than prevent their sickness and death in the first place. And just like greedy big Pharma he wants more customers!!! He has the Chutzpa to ask you to inject your kids with the same toxins that his customers were injected with which caused their cancer an illness. Then even more Chutzpa to ask you to support his death Camp. Perhaps we should rename it Camp Death! rather than Camp Simcha, since he promotes more sickness and death. The day is coming when everyone will see the truth, and charlatans like this who hide in the guise of being righteous will be revealed for the sickness death and evil they support and promote in this world! So much of this has all been debunked, a long time ago... It's just so tiring. Once, again, these posts attract all conspiracy theorists to start commenting. Seems like the crazies are back. Apparently you can't bother to look up the "truth about cancer": vaccines don't contain enough of those chemicals to have an effect on someone, and they certainly don't cause cancer. This should have been posted as a reply to "Simcha." I'm sorry, but it is plain wrong to publicly post someone's text message that they sent you individually. Even if they write an angry text, so what? And that text isn't just about her views on vaccinations. Its also about you, which is why it was sent to you and not to the internet. Furthermore, texts are forms of one-to-one communication, and should be treated as such. Even if you are motivated by pure revenge for what she said, it is bad manners. Revenge? For what? I don't care what she said about me. But she did say that I am a malshin, which means that there is no expectation of confidentiality. 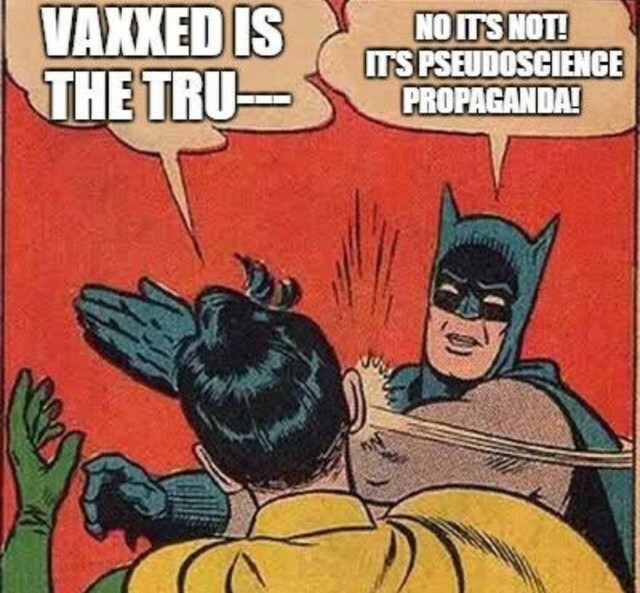 And it is very important, even life-saving, for people to know the kind of people behind the anti-vax movement. Mr Slifkin, your pomposity is beyond reproach. A little introspection goes a very long way. I'm pompous for saying to follow the consensus of physicians, and you're not pompous for saying that they are all wrong? !